Sen. Dan Feltes, D-Concord, is pictured recently with Sen. Lou D'Allesandro, D-Manchester. CONCORD – Casino gambling passed the state Senate Thursday on a roll call vote of 13-11, along with measures to increase stabilization grant funding for local schools, and to hire more staff to deal with cold case homicides and election monitoring. Sen. Lou D’Allesandro, D-Manchester, who has been working for more than 20 years to get a casino bill passed, brought Senate Bill 310-FN-A off the table on Thursday and got what he has long wanted. It now moves on to the House of Representatives for consideration. The bill, which was amended, would allow for two separate gaming licenses to be issued and the casinos would be in two separate locations. Sen. Martha Fuller Clark, D-Portsmouth, opposed the bill. She said with a casino now scheduled to open in Massachusetts, the only people going to these casinos will be people who live in the state. It would be “taking money out of pockets of our citizens,” who would then not be able to pay for other things like dining in New Hampshire restaurants or going to ski at New Hampshire resorts. She asked fellow senators to consider impacts on tourism and the concept of New Hampshire being a family-friendly state. “Be aware of what you are voting for because in the end, we will lose more than we gain,” Fuller Clark said. If the state had done something 20 years ago to accept casinos, it would be New Hampshire with $2.3 billion of investment rather than Massachusetts, he said. This week, he noted the House of Representatives overwhelming passed sports betting. “Let them make the decision. I don’t know if there is anything else I can say. Carpe Diem. Let’s seize the day,” D’Allesandro said. The Senate voted 14-10 in favor of SB 301, which would prevent further reductions of the business profits and business enterprise taxes, which were decreased to 7.9 percent and .675 percent in 2018. The measure would reinstitute municipal revenue sharing for the purpose of easing the burden of local property taxes using the projected additional $36.6 million in 2020 and $55.5 million in 2021 tax revenue. The Senate also voted unanimously to increase support for education stabilization funds in cities and towns across the state, saying that both schools and property taxpayers are hurting. They decided it should become part of the budget and tabled it for budget consideration. Senate Bill 309-FN-L, would restore funding aid to 2012 levels. Sen. Jay Kahn, D-Keene, said there is real despair and fear out there and rising property taxes to fund schools. Sen. Frank Giuda, R-Warren, said he was in strong support of this bill and the state needs to stop its annual four percent reduction. D’Allesandro shouted that he was “compelled to speak” in support of the bill. Putting it in the budget, and tabling it is the right thing to do, he said. A few more attorneys and state troopers could be hired to deal with cold case homicides and to supervise election law under bills that also advanced in the Senate on Thursday. Senate Bill 130-FN would allow for two new state trooper positions and two new attorney positions in the state. They would go after murderers who have eluded arrest. The cost including all equipment would be about $616,000 a year. The other bill, SB 230-FN, passed to strengthen election law, campaign finance law, and lobbying enforcement. This would mean two new attorneys would be hired. Sen. Dan Feltes, D-Concord, prime sponsor of SB 230, spoke to the issue after the vote. “If we’re serious about election law, campaign finance reform, and lobbying law enforcement, we need the staff to do the enforcement. 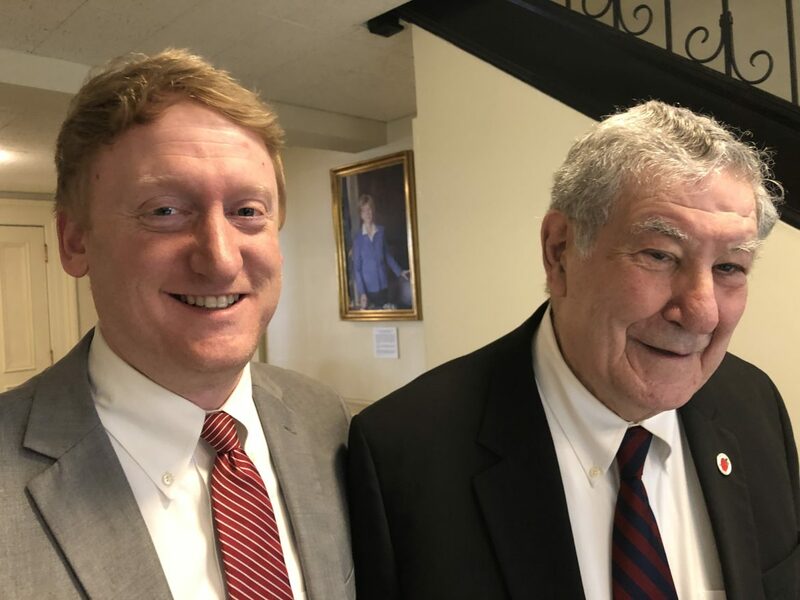 Today’s passage of SB 230 is a critical step forward to ensure the New Hampshire Attorney General’s Office has the resources to enforce our laws and ensure there is the necessary oversight and accountability to reinforce public confidence in the system,” Feltes said. Both bills were also placed on the table for consideration during the budget process. The Senate voted to get rid of the toll booths at Merrimack. Senate Bill 330-FN would eliminate the north- and south-bound tolls at Merrimack on the Everett Turnpike. The Senate also allowed for passage of SB 259-FN. The bill was voted “Ought to Pass” on a voice vote, then tabled for consideration during the budget. It moves forward Medicaid for Employed Adults with Disabilities or MEAD and would expand eligibility. The Senate also passed the Sunny Day fund, SB 247-FN in the department of business and economic affairs. Sen. Jeanne Dietsch, D-Peterborough, the prime sponsor, said that by “funding innovation grants and university research grants the Sunny-Day Fund would increase innovation, competitiveness, productivity, and workforce attraction. “My company was able to provide its own matches for such grants because I had earlier, successful ventures. But limiting our state to entrepreneurs on their second or third venture severely restricts our talent pool. Now, while the economy is strong, is the time to seed investment that will make it less likely we need to tap the rainy-day fund in a future downturn,” she said. After the bill passed, it was also tabled for consideration during the budget process.